We are located just off Interstate 15, exit 33B, take Blue Diamond Road (east) and make your first right into our park. We are located between I-15 and Las Vegas Blvd. You will enter the resort by passing through our arched entry and find yourself amidst a 55-acre Casablanca theme RV Resort. Our friendly and courteous resort staff will greet you at our front desk centered in our 24,000 square foot Clubhouse. Inside you will find a well-stocked convenience store, restaurant, fitness center, banquet facilities and free modem port. Also you can enjoy a luxurious tropical setting with waterfalls, winding date palms, and white sand beaches featuring two lagoon style swimming pools; an adult pool and spa and our family pool. We also feature a professional 18-hole putting course. Pets are welcome (limit 3), and for non-pet owners, we offer a no-pet area. For more information about our amenities, click here. We have three different types of sites; STANDARD, DELUXE and PREMIUM. The STANDARD sites consist of all “back-in” sites along the perimeter of the Resort and tandem in the southern area of the Resort, furthest from the Clubhouse and resort amenities. These Standard sites do not come with picnic tables and are Desert Landscape. The DELUXE sites consist of all “pull-thru” sites and are located closer to the Clubhouse and resort amenities. These sites also have lawn and picnic tables. Deluxe sites are $5 more than a Standard. The PREMIUM sites consist of all “pull-thru” and “back-in” sites and are located closest to the Clubhouse and resort amenities. These sites also have lawn and picnic tables. Premium sitesa are $5 more than a Deluxe. The PREMIUM PLUS sites are beautiful back-in sites with fencing, bar-b-q pits, and extended grassy areas. Premium Plus sites are $5 more than a Premium. The BIG RIG are 90 foot sites perfect for pull-thrus and are located in the South Park area of our Resort. Big Rig sites are $7 more than a Premium Plus. For more information about our rates, click here. All sites have 20, 30, and 50 amp service, sewer, cable and wifi. Oasis Las Vegas RV Resort honors Good Sam, AAA and FMCA discounts. Also, if you are looking for a great place to hold your rally, well your search is over. Oasis is the place! Our trained and helpful personnel can help to plan your rally festivities and make your rally an enjoyable and affordable event that you will never forget. For more information about rally group accomodations, click here. For your peace of mind we have 24 hour security with a centurion always posted at the front gate. If you are seeking an RV Resort that offers champagne-class amenities, affordable luxury and superb customer service call us today at 1-800-566-4707 or e-mail reservations@oasislasvegasrvresort.com and allow our friendly staff to make your reservation..
RV owners have many differing traits, but what they have in common is a love of the open road and a distinct preference for the comfort of their RV over a hotel room. That’s not to say that we don’t like to let our hair down now and then. The next time you’re planning a trip to Vegas why not take the RV with you and head for the Oasis Las Vegas RV Resort. The Oasis is a 55 acre custom built resort located off the I-15 at junction 33 just south of the Las Vegas Strip. The resort boasts 668 back in and pull through sites with full hookups (20/30/50 amp). There are Deluxe, Premium, Premium Plus, Big Rig and Standard sites, all on a concrete slab. Rates range from $47-$74 depending on both the site and the season. Sites include cable, a landline telephone jack and free Wi-Fi. There are six comfort stations located throughout the resort containing showers, restrooms and laundry facilities. A dump station is located by the entrance and propane is available in the storage area of the campground. 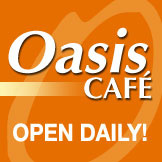 The Oasis Café, located in the 24,000 square foot Clubhouse, serves breakfast and lunch. The clubhouse also includes a convenience store with groceries and souvenirs; and a well equipped exercise room. RV clubs might want to take advantage of the Banquet Hall inside the clubhouse. Monday night is movie night at the Theater. The heated adult and children’s Pools and Spa with its sandy beach and pretty date palms, at the rear of the clubhouse, are open daily from 8am-11pm. An 18-hole putting course, horseshoe pits and Bocci Ball round off the onsite entertainment! This is a pet friendly resort (maximum 2) with dog runs by sites 624, 916 and 935 and also a Pet Park on Windmill Lane right outside the resort. There is also a pet free section of the RV Park, on the right hand side as you enter the resort, for those who like to avoid the company of four legged friends or for the golfers amongst you who want to be adjacent to 18 holes of the putting course. There are numerous places to visit in Las Vegas and you should certainly check out our local edition of the Examiner to get the inside track on breaking news and hot deals. There are also some great destinations within fifty miles of the city including Red Rock Canyon, the Valley of Fire, Lake Mead, and the Hoover Dam. After a long drive from Los Angeles this is a wonderful place for a weekend getaway, or to break your onward journey to Zion Canyon, Bryce Canyon or Lake Powell. The friendly staff and excellent amenities at this resort will make your stay here a real pleasure.